After seeing the client, go to File for Services Rendered and complete the form. Payments to providers are our highest priority and we will pay you electronically within 1-2 business days… normally faster than that! You will receive an email stating “O’Malley & Associates” has paid you (this is our legal business name); simply follow the instructions in the email to transfer funds to your account. Note: we have no control over the bank time to process the transfer and it could take up to 4 days. Our experience is the transfer is completed far faster than 4 days. We have elected this payment method as it is the easiest, fee-free system that we have found. How do I change the amount I charge, services I offer, or anything on my profile? Click this link and complete the form. Is there a user name or password that I need? No… we’ve tried to make our system as user-friendly as possible. What are the TWO things I need to keep in mind? Ask the client for the authorization code and LOCK IT IN. (This prevents the authorization code from being used anyplace else). File for services rendered AFTER the appointment with the client. How do I find the authorization code and what is it? When an employer pays their invoice to us, all enrolled employees will be notified that they have a new ‘session’ in their account that can be used at any of our network providers. They will receive an email that looks like the picture at right. Each session that is paid will have a unique authorization code – like a gift certificate – and can only be used one time. If you fail to get the authorization code, you provide services, and it turns out the client did not have an earned session, then we cannot pay you the $60 session reimbursement… this puts you at financial risk. 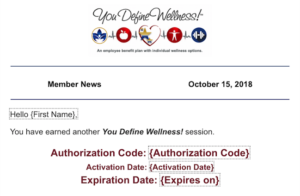 Ask the client for their authorization code when you schedule the appointment! We will train our clients to offer it to you; at the very least, we hope all will identify themselves as You Define Wellness clients prompting you to ask for it. What should I do if this confuses me? One of the side effects of creating something new is confusion… it happens to everyone. If you get lost, forget something, or need assistance in any way, call us a 303-222.7168; ext. 700 or complete the Contact Us form.